The Detroit Red Wings have signed veteran goaltender Jimmy Howard to a one-year extension. John Shannon of Sportsnet reports the deal will be for $4MM, and CapFriendly adds that he can earn up to $1.1MM in additional performance bonuses. Howard is eligible for performance bonuses as a 35+ player (as of the 26th) that is signing just a one-year deal. Scheduled to become an unrestricted free agent this summer, the goaltender has been open about his willingness to keep signing one-year deals as long as they keep him in Detroit. The deal will include zero trade protection. Howard, who will turn 35 next week, has posted a .908 save percentage this season through 48 games and remains a solid option in net for the Red Wings. In fact, he outplayed Jonathan Bernier this season and could very well enter next year still ready to make the majority of the starts. While he was a potential trade candidate at the deadline, both sides had expressed a desire to keep him in Detroit all season and with a one-year deal there is little risk for the Red Wings. The team can ride him until he’s no longer effective, and Howard can retire having only ever played for a single organization. Selected in the second round back in 2003, Howard starred at the University of Maine—recording an incredible .956 save percentage in his sophomore season—before jumping into professional hockey with both feet. After a few seasons as the starter for the Grand Rapids Griffins, he took over as the full-time NHL starter in 2009 and never looked back. Though he has dealt with injury, Howard never posted a save percentage under .906 during his decade as the starter for Detroit and twice received votes as a Vezina candidate. He has an all-time record of 240-171-68 in 509 regular season starts with the team. The Wings are finally climbing out of the salary cap troubles they put themselves in over the past few years, and signing Howard to a one-year deal will only give them even more flexibility going forward. Bernier carries just a $3MM cap hit for the next two seasons, meaning the combined tandem is still not prohibitively expensive. Red Wings goaltender Jimmy Howard was among those with a decent chance to be dealt by Monday’s trade deadline. Instead, he stayed put as GM Ken Holland told reporters, including Ted Kulfan of The Detroit News, that there was little to no interest in the 34-year-old as the trade market for goaltenders was virtually non-existent. With that option now off the table, Holland indicated that the plan now is to resume discussions regarding a potential contract extension. Those talks are expected to occur over the next few days. What will undoubtedly hurt Howard here is his recent struggles. In 2019 (a span of 17 appearances), he has posted a save percentage of .884, a rating that would be considered well below average for a backup netminder. The veteran was quite sharp over the first couple of months but has tapered off since then which presents a question for Holland and the Red Wings – which version will they get next season (and potentially beyond)? Howard is in the final season of his current contract which carries a cap hit of just over $5.29MM. 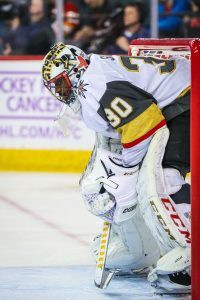 Considering his play as of late, the direction of the team and the fact they already have Jonathan Bernier ($3MM) locked up for two more years after this one, it stands to reason that Howard will need to take a pay cut on his current deal. Both sides have previously expressed their desire to get a new deal done with the expectation of a multi-year pact being required but given Howard’s recent play, it will be interesting to see if they ultimately settle on a one-year deal. He will be 35 by then so Detroit would have the ability to offer performance bonuses in a one-year contract which may be the best course of action here. While trade deadline season dominates the headlines, minor moves may actually give hints to what is on the way. Teams often prepare for a trade by moving certain pieces around, and we’ll be here keeping track of all those moves. As the Ottawa Senators prepare to move on from three key forwards, the team has embraced the youth movement. Drake Batherson and Logan Brown have both been recalled while Darren Archibald and Cody Goloubef are on their way to the AHL. The Chicago Blackhawks have recalled Henri Jokiharju today, as Brent Seabrook will be unable to play due to an abdominal strain. Carl Dahlstrom is also questionable with an illness, meaning Jokiharju could get into his first NHL game this month. The young defenseman is up under emergency conditions, though that could be changed should the team want him to stay even after Seabrook is healthy enough to play. The Detroit Red Wings have called up goaltender Harri Sateri and sent Christoffer Ehn to the minor leagues. Jimmy Howard is dealing with an illness, meaning Jonathan Bernier will get the start tonight. Tyler Gaudet was up for just a single day with the Nashville Predators, and is now on his way back down to the AHL. Gaudet hasn’t played in the NHL since the 2016-17 season, but has 23 points in 41 games for the Milwaukee Admirals this year.